First off — never ride too close to the edge of the road; you are more likely to run into problems there including debris, bad road surface conditions or other obstructions like drainage grates and so forth. See where to ride on the road for more. 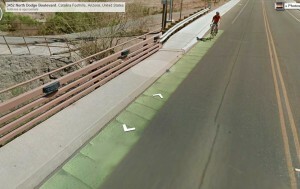 (I’m not sure if this reflects what is there now, or rather what was there at the time of this bad crash) Here’s a google maps street view of the Dodge Blvd bridge over the Rillito near Tucson (apparently it’s owned by Pima County). There is some sort of weird 2′ wide band of green (paint, i guess?) directly next to the curb — from what i gather the gap referred to below is between the curb and the green paint. The google street view coincidentally caught a cyclist dutifully riding within that very narrow band of green paint, just inches from the “drainage gap”. This is a very bad, very sub-standard (non-standard is more like it). It appears to have been designed by somebody who decided that at all costs, there must be a segregated bicycle facility here; even though there’s plainly not enough room to make a safe separate facility. A (real) bike lane next to a curb must be a minimum of 5 feet per AASHTO guidelines. This appears to be something like 2.5 feet. Sheesh.! 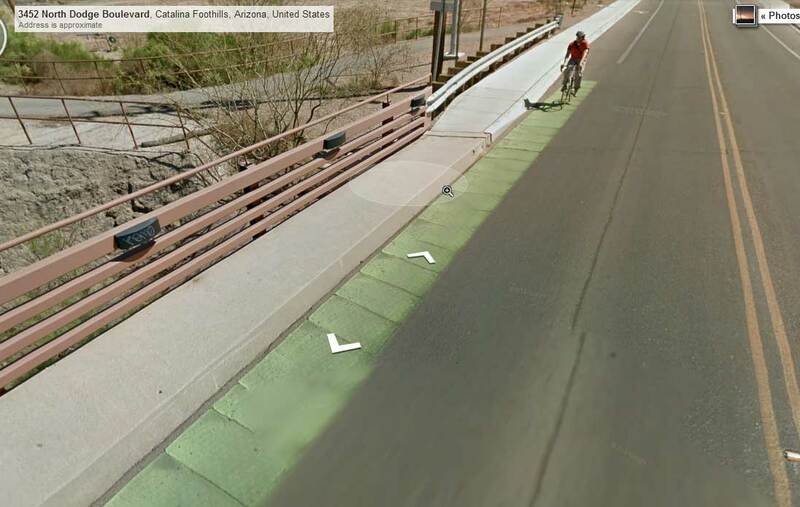 I note that “Interim Approval for Optional Use of Green Colored Pavement for Bike Lanes (IA-14)” has been granted back in 2011; maybe, despite what Pima Co DOT (officially, but not colloquially) claims, this is actually a bike lane. Albeit a very bad one. tucsonvelo.com story about the crash. A cyclist was seriously injured; and is preparing to sue the county for $6M. In a twist, he works for the county. The second-most-powerful person in the Pima County administration has filed a claim against the county, asking for $6 million in damages… Martin Willett, the chief deputy county administrator, was seriously injured in June when the front wheel of his bike got stuck in a “drainage gap” on the Dodge Boulevard Bridge…. Shortly after the accident, county officials closed the bridge to cyclists and work was performed to make the area safer for those traveling on two wheels…. “Former Deputy Pima County Administrator Martin Willett settled his claim in April for $1.8 million” which was mentioned in another story where a German bicyclist Frank Dionies is suing Pima County over injuries he received at an odd bikelane(?) arrangement at North Kolb and Sabino Canyon Roads.